You know that excitement you feel when you open the door and a guy in a uniform is holding a huge bouquet of flowers in his hands? Imagine if instead of colorful buds he was holding a cake box? Fun factor just went way up, right? Bake Me A Wish! does just that. 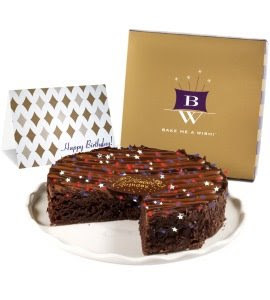 They deliver cakes right to your door for birthdays, celebrations, or just because. They'll even deliver cakes to our hardworking soldiers overseas. How cool is that? There are a few Bake Me A Wish! coupon codes bouncing around online, the best of which is 15% off your order with code ENT2007. I don't know when this code expires, so you should definitely take advantage of it soon! Right now on the site you can save 10% by ordering two or more Bake Me A Wish! 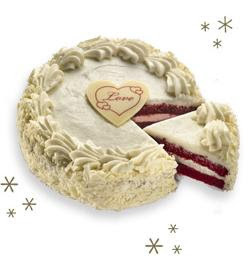 cakes, and you have the benefit of knowing that 5% of your order goes towards Bake Me a Wish! Operation: Birthday Cake which sends cakes each month to soldiers overseas. It's no secret that around here we love books. Especially adorable little board books with fun cutouts. The Silver Dolphin Amazing Baby books are no exception. 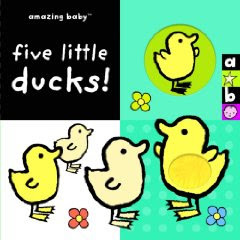 I was fortunate enough to be asked to review Five Little Ducks! and Rainbow Fun! Both of which have become instant favorites in our home. Five Little Ducks! is a cute little story that every mom can relate to on some level. A mama calls and her little ducks don't always come back. Each page one more duck goes missing. Of course at the end they all come back, safe and sound, much to everyone's delight. This book is great for budding little counters. Each page represents a number and multiple opportunities to count it - flowers, ducks, cutouts! The last page features all the little ducklings and a fuzzy worried mama that toddlers can pat for comfort. Budding readers will appreciate the simple text and the fact that the relevant numbers are bolded for easy spotting. Rainbow Fun! focuses on teaching children the colors of the rainbow. (OK, if we're going to be picky, the book explores primary and secondary colors rather than the actual colors of the rainbow since it uses the words blue and purple instead of indigo and violet, but whatever.) Each page features a different color and sweet little characters that will keep your child entertained. The last page rewards you with a sparkling rainbow and all the friends that you've made along the way. Once again, budding readers will be able to easily spot the bolded names of the colors. - Bright, colorful, chunky little board books that are sure to find a welcome home on your shelf. 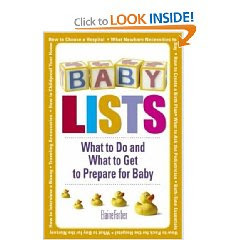 - At $5.95 per book these are more affordable than many board books on the market. - Educational books that will grow with your child and entertain toddlers and preschoolers both. -Rainbow Fun! doesn't have a running story, each page can stand alone, so it's not a given that your child will sit through the whole book. But, then again, what ever guarantees that a toddler will listen to the end of a story? In conclusion, next time you're looking for a sweet little board book as a gift or for your own little one you should definitely snap these guys up! Thanks to the generosity of Silver Dolphin Books, one lucky The Lemonade Stand reader will win both of these books! - Visit the Silver Dolphin Book site and browse around. Come back and leave a comment letting us know which book caught your eye. - OR leave a comment telling us which is your child's favorite book this week. - For extra entries Tweet, blog, or email your friends about this giveaway. Then come back and leave a comment telling us what you did. - Sign up for this blog's feed or It's my life...'s blog feed. Then come back and leave a comment telling us what you did. Don't forget to make sure to leave an email or a way for me to contact you! Contest will run until Wednesday, March 4 at 10pm PST. Winner will be announced on Thursday, March 5. This contest is now closed. Stay tuned for more great opportunities! You know what's better than candy? Lots and lots of candy? It's lots and lots of candy on sale. Every year, for a very short period of time the infamous Jelly Belly company puts their irregular jelly beans - all the ones that have odd shapes and colors, but still taste just as great - on sale. You can either get five 2 lb. bags of Belly Flops for the price of two bags, or, if you're sweet tooth is as insatiable as mine, you can get one 12-count Belly Flop case for $50 instead of $97.20! So? What are you waiting for! Hurry over to the Jelly Belly Outlet Store! Get your Belly Flops Now! Did I mention you should hurry? The sale ends this Sunday, February 22nd and the Belly Flops ALWAYS sell out! Hey! That rhymes. How perfect! Congratulations ladies, I'll be emailing you so you can give me your mailing addresses! 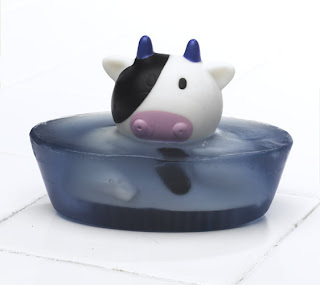 What could be sweeter than a cute little bath toy lodged in a fun sudsy soap? 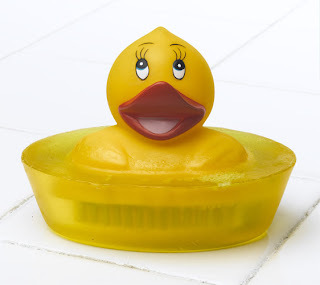 Well, how about instead of a bath toy you got an adorable little nail brush? Wett Giggles, Inc has come up with perfect little gifts. Use them as party favors or as birthday presents. Give them as part of a gift for wedding or baby showers! These little guys are sure to bring smiles to everyone's faces. - Adorable little characters encased in sweet smelling soap that come individually wrapped and adorned with a matching ribbon. - Just enough soap to make it worth your investment, but not so much soap that a child would get frustrated about getting to the prize at the center. - Encourage hygiene in little kids by introducing a fun new way to scrub away the dirt that builds up under your nails! 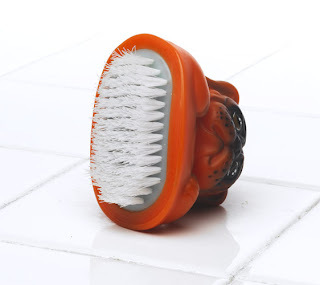 - Love the soap, but can live without a tubful of nail brushes? You can buy the soap or the nail brushes separately. - Quite affordable! $10/soap+brush, $8/soap no brush, $5/brush no soap. - Kosher glycerin of vegetable origin! - These things are so darn cute you're going to need to buy the whole collection. I'm sorry. So, in conclusion, you need one or ten of these right away. And because Wett Giggles, Inc rocks, they've given me a discount code to share with you. Right now, on the Wett Giggles site, there's a 20% discount on all orders and just for The Lemonade Stand readers, until the end of February, by using the discount code: Carvp09 (Careful! Case sensitive!) you also get free shipping! So, what are you waiting for? Get that gift closet full of cute little dogs, ducks, and cows! In a house where laptops and computers abound, it wasn't shocking that C would one day beg to play computer games. It started as a plea to play online Disney and Sesame Street games and it escalated to the games she saw advertised in the Christmas catalogs. Luckily for me, just as I was about to lose the fight, the wonderful people at Kutoka Interactive emailed me and asked me if we'd be willing to test their new preschool game. I jumped at the chance. Of course then we got bronchitis, and the flu, and every other ailment under the sun, so it was a while before we broke out the box and popped in the CD. Then I kicked myself that we hadn't done it sooner because it would have a been a great distraction while we were all so sick. But you know, hindsight 20/20 and all that. 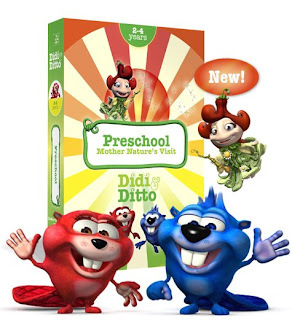 Didi & Ditto Preschool - Mother Nature's Visit is a hit as far as computer games go. The graphics are awesome, the characters are endearing, and the learning is top notch. C is obsessed and M, the designated grown-up player, swears that the game isn't annoying for adults. In fact, this afternoon C was playing nicely by herself and he couldn't stay away. - The game has amazing graphics and animation as well as adorable cartoon characters. - The games and puzzles start out easy and gradually get harder as the child learns and progresses. Each activity builds on the previous ones, creating learning in a way that mimics preschool classroom learning. - Cute music and catchy victory tune. C loves reaching the victory tune stage, she sings along every time! - Great learning! Provides a place to work on problem solving skills, letter recognition, and puzzle solving. - Boys and girls can choose to play as either Didi, the girl, or Ditto, the boy, great for preschoolers who are all about gender differences! - M has found that after a while the memory games become a bit repetitive and predictable. C doesn't agree. - Like many games, the CD has to be in the computer to play the game. There's no way to download the entire game to the computer. In conclusion, Didi & Ditto Preschool is an amazing game and at $19.99 on the Kutoka site or $25.99 on Amazon it's a great deal! Share Win the Ferrero Chocolates! I know Valentines Day is supposed to be all about love and hearts and all the other lovey dovey stuff, but really, it's all about the chocolate, right? If you love someone you give them chocolate. And, well, I love you. Each and every one of you. And so I'm going to give you chocolate. OK. Fine. I love each and every one of you, but I can only give real chocolates to two of you. 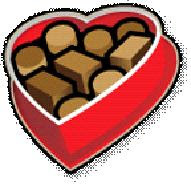 The rest of you get virtual chocolates and my undying love. And they're not just any chocolates, they're Ferrero chocolates. The wonderful people from The Ferrero Company are not just donating money each time you send a Valentines card, but they're donating love chocolate to my amazing readers. Leave a comment saying you want some delicious chocolatey chocolates. Go to their site, send a nice card to someone, anyone, and come back and leave a comment letting me know it's done. Send love + get chocolate = everyone wins. Tweet, blog, email your friends to win more entries. 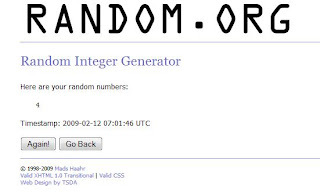 For each way you promote this giveaway come back and leave a comment so I can give you credit! Sign up for this blog's feed or It's my life...'s feed to get another entry. Again, don't forget to come back and tell me! Ready? Set? Go Share Something Sweet! Psssst: Giveaway ends Wednesday, February 18, at 10pm PST, so get lovin'! Comment #4! Congratulations Susan! Email coming your way, let me know if you don't get it! Babies wear onesies. Lots of onesies. There are the hand-me-downs, the gifts, the collectibles from trips and memorable events. There are some with long sleeves and some with short sleeves, some that are easy to button, and some that are so irritatingly hard to snap that they live in the back of the drawer with all the other rejects. We have them all, but it's pretty safe to say that there isn't a single stylish one in the bunch. Well, now, thanks to Too Hot Tot Bling, that's no longer true. Today Little L is sporting a onesie that's both cute and stylish. Their personalizable bling covered onesies are so adorable that all my friends covet the one Little L wears with pride. Whenever she sees someone she pulls the shirt away from her belly and proclaims loudly "Pweety! Pweety!" just in case they hadn't noticed her sparkly name and crown. Luckily she has a pretty uncommon name or I'm sure someone would have "borrowed" it already. - The onesies are originally from Carter's so you know you're getting a quality item that's both soft and durable. - After numerous washes and tumbles in the dryer the bling has stayed put perfectly. - Customizable! Or not! It's your choice. - Comes wrapped in a sweet little muslin bag. Perfect for baby showers or new baby gifts. - It is a onesie so she will outgrow it sooner than if it were a T-shirt. That said, Toddler/Kids sizes are available on special order. - Slightly on the pricey side - $20 for short sleeved $25 for long sleeved - but not astronomical as far as classy gifts go, and as I said, the durability is amazing. Hop on over to the Too Hot Tot Bling blog to order your very own adorable onesie. While you're there check out the other fun custom made things you can order! Blinged out sneaks anyone? One lucky The Lemonade Stand reader is going to win a Too Hot Tot Bling onesie of his or her very own! No, not Little L's, she's not giving hers up! - Go visit the Too Hot Tot Bling blog and browse around. Come back and leave a comment letting us know which short sleeved onesie you have your eye on. Don't forget to let us know what size you need! Don't forget to make sure to leave an email or a way for me to contact you! - In your comment tell us about your favorite shirt as a child, you know, the one your mom had to wash every day because you couldn't live without it! Didn't have one? Tell us about your child's current favorite. Contest will run until Wednesday, February 11 at 10pm PST. Winner will be announced on Thursday, February 12. And if you're so inclined, please nominate me.